Myles Turner joins The Starters to discuss how his Pacers can handle the Celtics in the playoffs, why he deserves Defensive Player of the Year, and his Game of Thrones prediction! 2015-16: NBA All-Rookie Second Team … NBA Eastern Conference Rookie of the Month (February 2016). Played in 60 games and made 30 starts during his rookie season, posting averages of 10.3 points, 5.5 rebounds and 1.4 blocks in 22.8 minutes per game…Shot 49.8 percent from the field and 72.7 percent from the free throw line…Among NBA rookies, Turner ranked seventh in scoring, fifth in rebounding, sixth in field goal percentage and third in blocked shots…Scored in double figures 28 times with six games of 20 or more points…Recorded 10 or more rebounds seven times with four double-doubles… Broke out with 25 points on 11-for-13 shooting from the field to go with a team-high seven rebounds in 29 minutes off the bench at Denver, 1/17…Added 15 points and four blocks in 31 minutes the following game at Phoenix, 1/19, before pouring in a career-high 31 points on 12-17 shooting at Golden State, 1/22…Turner became the first Pacers rookie to score 30 or more points since March 5, 2002, when Jamaal Tinsley finished with 30 in a win over Orlando…Made his first-career start against Atlanta, 1/28, as he finished with 20 points on 9-for-17 shooting in the win over the Hawks…Finished with 16 points and six blocked shots – the most by any Pacers player this season – in the road win at Oklahoma City, 2/19…Recorded 24 points and a season high 16 rebounds on the day of his 20th birthday in the win over New Orleans, 3/24…Became the fourth Pacers rookie in franchise history and the first since Jamaal Tinsley in 2002-03 to be named Eastern Conference Rookie of the Month as he averaged 13.4 points, 6.6 rebounds and 1.8 blocks per game while shooting 51.0 percent from the field during the month of February…Averaged 11.5 points, 6.7 rebounds and 1.6 blocks per game in 30 starts compared to 9.2 points, 4.4 rebounds and 1.2 blocks per game in 30 appearances off the bench…Missed 20 games (11/13-12/26) with a chip fracture in his left thumb…Recorded two DNP-CD’s. 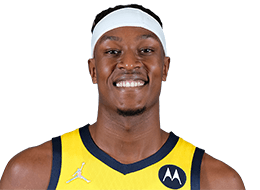 Appeared in all seven games and made four starts during Indiana’s First Round series against Toronto … Averaged 10.3 points and 6.4 rebounds In 28.1 minutes per game … Led all NBA players through the opening round of the playoffs and set a Pacers’ playoff franchise record with 23 blocked shots, 3.3 per game … Blocked at least two shots in all seven contests with four or more in three games … Shot 46.5 percent from the field and 66.7 percent from the foul line in the series … Came off the bench the first three games of the series and averaged 11.7 points on 61.5 percent shooting to go with 5.0 rebounds and 3.3 blocks per game … Scored 10 points, grabbed five rebounds and blocked five shots - tied for the most by any player in the playoffs - in Indiana’s Game 1 win at Toronto, 4/16 … Posted his highest scoring game of the series with 17 points to go with eight rebounds and three blocks In 31 minutes off the bench in Game 3, 4/21 … Was inserted into the starting lineup for Game 4 and started each of the last four games, averaging 9.3 points, 7.5 rebounds and 3.3 blocks as a starter … Scored 15 points, grabbed nine rebounds and blocked four shots in the Pacers’ Game 6 victory, 4/29. 2016: Named to the United States Men’s National Select Team and participated alongside the 2016 U.S. Men’s National Team prior to the 2016 Olympic Games ... 2014: Helped the U.S. U-18 earn the gold medal in the Americas Championships in Colorado Springs, CO ... Averaged 7.4 points, 4.8 rebounds and 3.6 blocks ... Led all players in tournament play with 18 blocked shots. Earned Big-12 Freshman of the Year and All-Big 12 Third Team honors after appearing in all 34 games (making seven starts) during his only season at the University of Texas in 2014-15 … Averaged 10.1 points, 6.5 rebounds and 2.6 blocks per game in 22.2 minutes per game … Shot 45.5 percent from the field, 27.4 percent from three-point range and 83.9 percent from the free throw line … Led the Big 12 Conference by a wide margin with 89 blocked shots – 31 more than the next player on the list (teammate Cameron Ridley, 57) … Finished third in the conference in free throw percentage and sixth in rebounding … In just his fifth-career game during a win over St. Francis (PA) on Nov. 25, Turner matched a school record for single-game field goal percentage that had stood since 1962 as he made 11-of-12 shots in a 25-point effort … scored in double figures 13 times, including three games with 20 or more points … Pulled down 10 or more rebounds seven times while posting four double-doubles … Scored a career-high 26 points to go with nine rebounds against Lipscomb on Dec. 16 … Finished with 25 points and a season-high 12 rebounds in the win over Texas Tech on Feb. 14. Full name is Myles Christian Turner … son of David and Mary Turner … has one younger sister, Mya (13) … born March 24, 1996 in Bedford, Texas … wore jersey No. 52 at Texas to honor Habram Rosario, a close friend and middle school teammate who passed from leukemia when Myles was in ninth grade (Rosario wore No. 52 on the middle school team) … Studied psychology at the University of Texas … Played in the McDonald’s All-American Game, Jordan Brand Classic and was a member of the U.S. National Team at the Nike Hoop Summit in the spring following his senior season at Euless Trinity High School in Bedford, Texas … Averaged 18.1 points, 12.2 rebounds and 6.8 blocks per game as a senior while leading Trinity to a 24-7 overall record.